Crocodiles, along with alligators, gharials and caimans, make up a group of reptiles known as crocodilians that have been around since the age of the dinosaurs and still look very much like they did millions of years ago. Like all reptiles, crocodiles are covered in scales, lay eggs and are cold-blooded, meaning that their body temperatures depend on outside conditions. Crocodiles spend much of their time in water. Their eyes are therefore on top of their heads so that they can see their surroundings while their bodies are almost completely underwater. Crocodiles see very well, even at night, and their hearing and smell senses are also excellent. They swim by swaying their tails from side to side and can run fast, though not for very long. These abilities, along with their extremely powerful jaws, make crocodiles great hunters. Though they only eat meat, crocodiles are not exactly picky eaters. All crocodilians eat fish, but they will go after any animal that gets too close. Small to medium-sized crocodiles, like the New Guinea crocodile of Papua New Guinea and Indonesia, also prey on frogs, turtles, lizards and birds. The saltwater crocodile, the largest living reptile with lengths of more than 20 feet, can eat a monkey in one feeding, and a water buffalo or even a shark in the next. Saltwater crocodiles and other large species, like the Nile crocodiles of Africa, have attacked humans. Because they store fat in their tails, crocodiles don't need to eat often like humans do; the bigger species can go up to two years without eating. They may look scary, but female crocodiles, which are always smaller than males of the same species, are very caring mothers. Unlike most reptiles, crocodile moms look after their nests, which they build on land, and even roll their eggs in their mouths to help their newborns hatch. After their babies are born, crocodile moms carry them to water and protect them from predators until they are able to swim on their own. Crocodiles and alligators may look similar -- they are related, after all -- but you can tell them apart by looking at the snout. The snout of an alligator is rounded, while the shape of a crocodile's snout is closer to a triangle. Color is another clue: alligators have dark skin, while crocodiles have grayish-green skin. 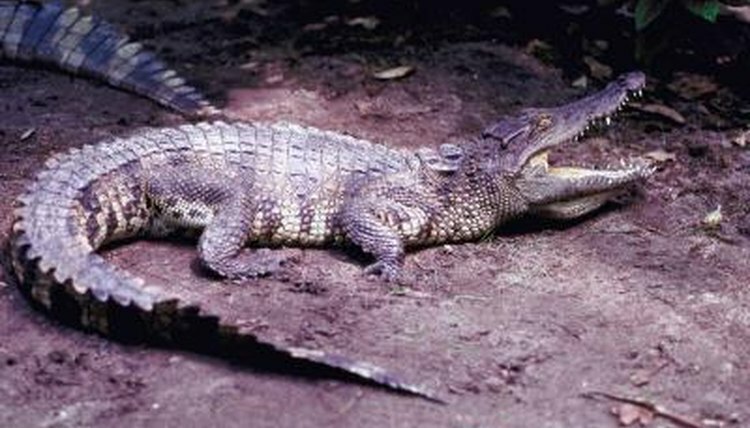 Moreover, alligators usually live in freshwater habitats, whereas crocodiles are found in saltwater environments. Finally, you are looking at a crocodile if any of the animal's lower teeth are visible when his mouth is closed. As a result of too much hunting and destruction of their habitats, the Orinoco crocodile of South America, the Siamese crocodile of Southeast Asia, the Philippines crocodile and the Cuban crocodile are endangered, which means they are at risk of disappearing forever. Are There Alligators in the Florida Keys Coast of the Gulf of Mexico? Whats the Difference Between the Nile Crocodile and the Florida Alligator? What are Cousins of the Alligator? What Animals Live in a Tropical Rainforest? How Powerful is a Crocodile's Bite? What Is Stronger, an Alligator or a Crocodile? What Continents Do Alligators Live On? Where Are Hippos Mostly Found? Does a Crocodile Have Gills or Lungs?